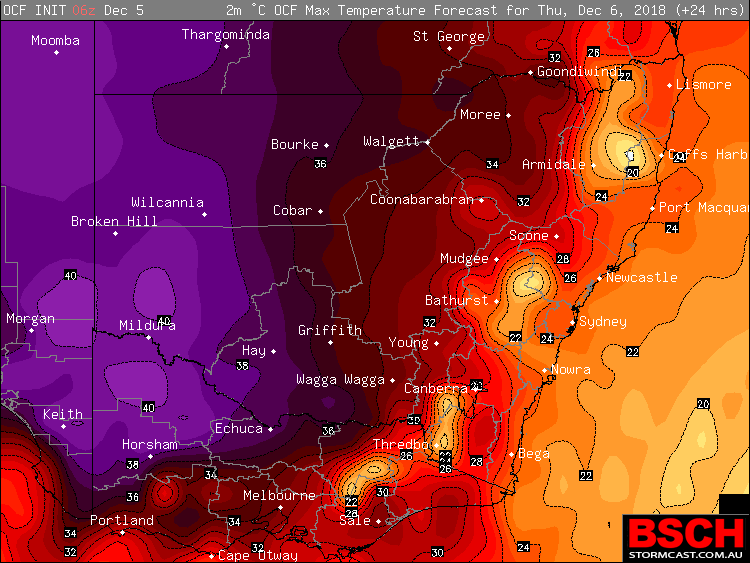 Summer Heat FINALLY Coming For VIC & Inland NSW! 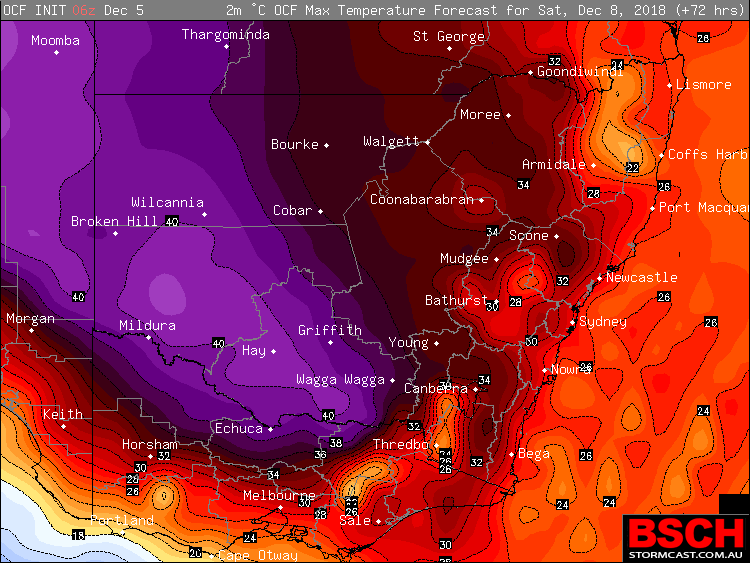 Home/Forecast/Summer Heat FINALLY Coming For VIC & Inland NSW! Summer looks set to FINALLY arrive across large parts of Inland NSW and Victoria over the next several days as temperatures push well above normal and into the high 30’s / low 40’s across both areas for several days. Above image: Thursday maximums for OCF / BSCH. An increased Northerly flow, directing hot air across Inland NSW and into VIC is expected to develop during Thursday ahead of a surfacer trough moving across South Australia. This trough is expected to enter Western NSW and VIC during Friday and become very slow moving as it starts to shift North and East during Saturday and into Sunday. The positioning of the trough will be vital for where the heat will be focused, however it seems likely that large parts of Inland NSW and the Western half of VIC are expected to see Summer heat arrive for the first time all season. The heat should be short lived across Melbourne, reaching the mid 30’s on Thursday before pushing the high 30’s on Friday. After that, Southerly winds will dominate and drop temperatures back into the low 20’s. For other areas like South West NSW, North West VIC and into Southern and Western NSW. The heat will last much longer and will technically be classed as a low to medium strength heatwave. Forecast OCF Maximums for Thursday across VIC & NSW. Image via BSCH. A heatwave is classed by temperatures being 5ºc above average for 3 consecutive days. The confusion will come around Victoria and NSW experiencing bursts of extreme heat followed by well above average conditions that balance out the temperatures. So this heat is by no means abnormal, but it is still technically a heatwave. Mildura and Hay both average 30ºc for December, and for the next 7 days they’re both expected to exceed 35ºc and push 40ºc on some days. 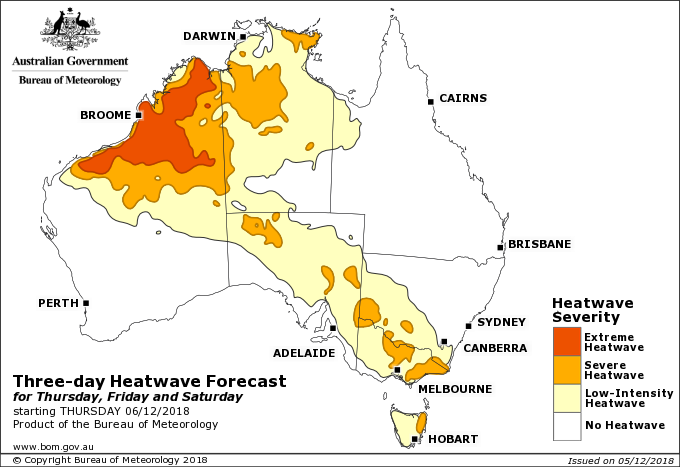 Ivanhoe averages 33ºc and will likely see temperatures into the high 30’s for most days over the coming week as this heat sits over the same area. Thankfully models are hinting at storms increasing across both VIC and Southern / South West NSW which could at least make the heat useful, and hopefully bring some much needed rain to communities, but unfortunately models are also hitting at a lack of rain overall. For storm forecasts become a Higgins Storm Chasing Subscriber HERE. BOM Heatwave Pilot showing low to moderate heatwave across VIC and Southern NSW. Thursday to Saturday.